Sheesh, it’s been a while! I have been incredibly busy with wedding planning (73 DAYS!! ), work and my new training program (these each call for a blog post of their own)! Wedding planning is coming along wonderfully!! I have to admit I started to stress about a month ago (3 months out) when I thought I was SO FAR BEHIND in planning. Luckily I am marrying an incredible man who sat me down and had me create a list of the things we still had to do; he then said, “Do you see how simple some of these things are. I will do this tomorrow, you can do this now, we will do this next weekend.” He put everything into perspective for me and I calmed right down! Making a list has been the most AMAZING thing I have ever done! I love crossing things off, I feel so accomplished. 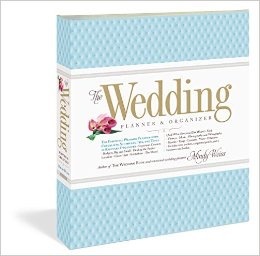 I have Mindy Weiss’s Wedding Planner and Organizer that was created with time lines and lists, which I use for organizing everything from contracts, to dress swatches, to floral plans! 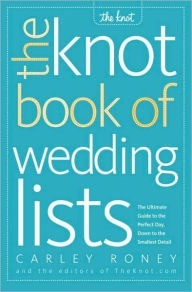 I also have The Knot Book of Wedding Lists. It goes into INCREDIBLE ..and unnecessary.. detail of everything you “need” to do. However there’s a shortened version of the long lists in the very front of the book that is maybe 3-4 pages long.. I will tell you now, that’s ALL YOU NEED! I don’t think I ever went all the way into the book unless I absolutely was like uhm what’s that! If you’re getting married one day, take this advice.. throw away every list anyone gives to you after you read it over and CREATE YOUR OWN! Like I said, I only use the very first pages of The Knot Book and from there I created my own. It’s important to know that some things you just can’t cross off your list until the week of the wedding, the day before the wedding or even the day OF the wedding! This took me a little while to wrap my head around, but once I sat down, got organized and really looked at what else we had to do at about 2 months out, I realized all was right in the world and I could relax. As of now we just have small things to do since we did everything earlier than most people, just to simply ease my mind. We have to finalize the flowers, the DJ stuff, and the photo/video details, all of which won’t be discussed until the month of the wedding. We also need to get parents gifts, a little special something for our ring bearer, create drink signs, welcome bags and pick out ties for the boys! Not so bad huh?! Then I have fun stuff to do, like put the girls’ gifts together, schedule a bridesmaids brunch.. and maybe a paddle boarding outing! 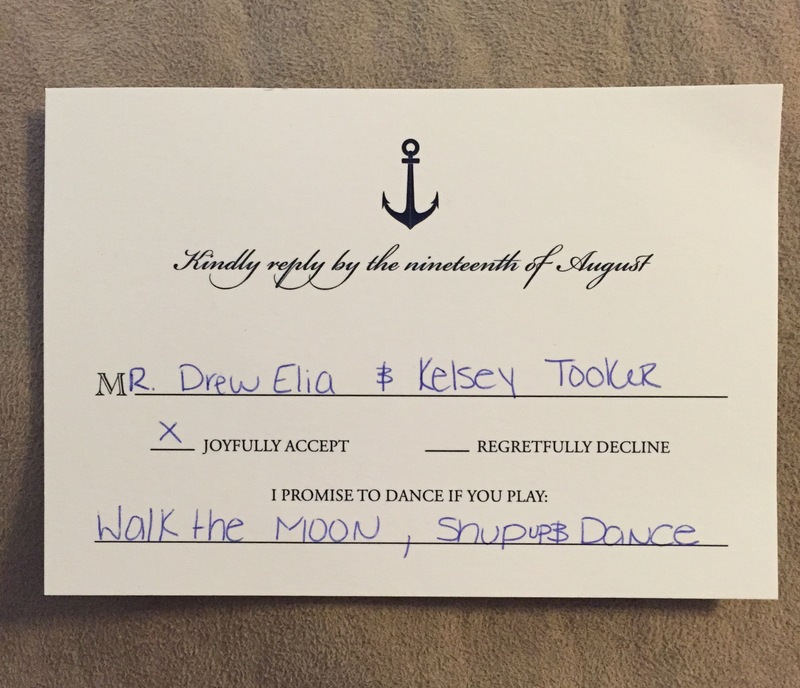 We started getting the response cards back and something cute we added to them was a line for our guests to request a song! So I’ve been organizing a spread sheet to give to our DJ! We’re in the process of finalizing our transportation for our guests and making final decisions on our wedding “cake” ;). My wedding band is in and ready to be picked up and I CANNOT WAIT TO SEE IT!! We got my band from my family jeweler (Steven Chiarelli Jewelers) who has done my grandmas jewelry, my moms engagement ring and wedding band, and who created my engagement ring specifically for me! Christian and I found his wedding band while in Cali. We were walking the strip in Santa Monica when we saw the coolest jewelry store with the most unique, hand-crafted pieces. When we saw this band we knew it was perfect, if only it were darker.. when the jeweler heard that, he took the ring, “oxidized” it and showed it to us.. it was darker, and perfect! We even got to meet the jeweler who owned the shop and who CREATED Christian’s one of a kind wedding band! SO COOL! Throughout this whole process the most consistent and important thing to me was making sure Christian and I were on the same page, regardless of outside forces. After all, I am going to be his WIFEY!! ♥ I like to think I have been true to myself and my future husband thus far in planning and deciding on everything WE truly want. We’ve been creating our day to fit US, making changes to the common traditions, we feel, just do not reflect our personalities. We still have about 2 months left, but my advice for any newly engaged man/woman or soon to be wedding planner: Remember that this is YOUR day, not your mom’s or dad’s or your best friend’s. This day should reflect YOU; so you don’t want to wear white cause you hate it.. DON’T WEAR IT! So you’d rather throw a 6 hour cocktail party than have any fancy sit down shin-dig.. COCKTAIL AWAY! Whatever you do, stay true to you and your future Mr./Mrs.! Take everyone’s advice as a nice gesture, but discard the advice that doesn’t pertain to you. In the end of it all, it’s just you and your best friend making it OFFICIAL!! I will have so much more to say as the date gets closer, I am going to try to stick to my blogging again! This was so incredibly therapeutic to write everything down and just put it all out there! I’m open for any suggestions or advice as the day creeps closer and closer (I’m open to it, doesn’t mean I’ll listen to it hehe). And I’d LOVE to hear about others’ special day, or unique tweaks to their wedding day! !